Startup Prieto Battery is working to create the world’s best rechargeable battery using an environmentally friendly manufacturing process. It’s focus on all the three major components of the existing battery architecture. Their environmentally-friendly, water-based manufacturing process is highly repeatable, easily scalable, and very cost effective. Prieto Battery claims that this ground up approach redefines the standard for battery production and performance and is necessary to break out of the decades-long incremental approach to building a better battery. The goal - a battery that is safe, has more power, charges faster, lasts longer, costs less and can be used across a variety of applications and devices. 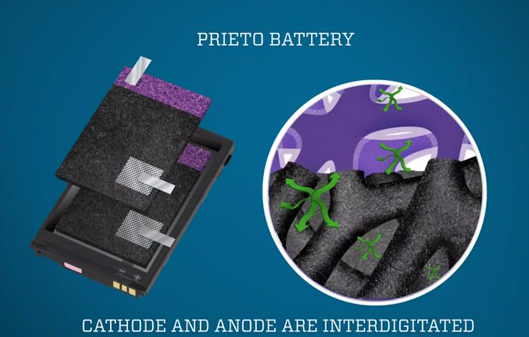 Prieto Battery is not limited by the traditional incremental approach to battery design which focuses on improving one of the three key elements of the existing two-dimensional, acid-based batteries – an anode, a cathode, and a solid or liquid that separates the two. As per Prieto Battery site, this patent-pending architecture is designed around a porous copper structure (copper foam), conformally coated by an ultra-thin polymer electrolyte and then surrounded by a cathode matrix. The result is a three-dimensionally structured lithium-ion battery composed of interpenetrating electrodes with extremely short Li+ diffusion distances and a power density that is orders of magnitude greater than comparable two-dimensional architectures in use today. The use of copper antimonide (Cu2Sb) electrodeposited onto copper foam lends an unprecedented degree of stability to the anode and has already demonstrated excellent capacity over extensive cycling. Such materials and the underlying technologies lend themselves to low cost manufacturing and production scale-up. The realization of this sophisticated battery required the development of myriad cutting-edge enabling technologies. At the heart of this product is a patent-pending technology for the fabrication of the Cu2Sb copper foam substrate. Using a novel electrodeposition method, Cu2Sb may be directly deposited without the costly requirement of further annealing or other post-treatments. This technique ensures continuous electrical contact throughout the 3D anode. Prieto Battery could help companies to innovate in many areas, like - Batteries can be shaped to fit spaces that are inaccessible to traditional batteries, performance characteristics that have the potential to significantly exceed traditional options for cutting edge applications, make it safer. They are targeting for applications to various sectors where they think can make an impact are Wearables, Custom shapes, Tablets, Power Tools, Military Applications, Industrial Solutions and Electric Vehicles. Prieto has from the start sought simplicity, using common materials in a low-cost manufacturing process that can easily be scaled up. The company’s first product is not a full battery but a drop-in replacement copper foam anode that will replace graphite anodes in conventional batteries. In September Prieto announced a partnership with Intel that enables the startup to draw on the expertise of the chip maker’s Technology Manufacturing Group. Prieto’s first replacement anodes could be on the market by late 2016, says its founder, and a complete battery could follow by 2018, as reported by Technology Review.